No Rest for the Convalescence Stall! Yesterday afternoon (Saturday) the farm was at peace. So much so that we finally addressed some long neglected chores - mowing the lawn and disposing of the mountain of feed bags by the back door, for example. Thunderstorms in the distance threatened to soak the farm during the night, so we worked until sundown to accomplish as much as possible in case the bad weather would be with us in the morning. The horses all seemed quiet, happily grazing in newly mowed fields. Nothing appeared to be out of the ordinary. For once. Sunday morning, as breakfasts were distributed, Jubal did not come into his stall. Now, Jubal is always - every meal, 100% of the time - the first one in his group to assume the feeding position. Not so this morning. Jubal stayed put where he was in the shed, even when Fitz pointed out that Jubal was in his feeding station. A quick glance up and down easily revealed the problem. Jubal's right foreleg was noticeably swollen to the knee. There was a small, superficial-looking wound on the back of his fetlock, but nothing that looked like it should cause the reaction we saw. We brought out the thermometer and found Jubal's temperature to be 103.2. 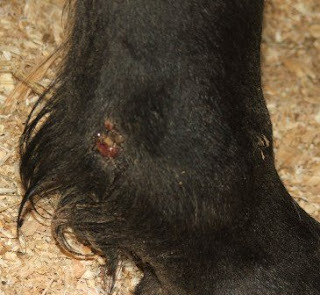 Normal rectal temps for a horse are in the 99-100 range, so this was a significant fever. Our vet was here within an hour. Clipping the hair from around the wound and cleaning the area revealed no puncture wound, confirmed by an ultrasound scan. Jubal's injury appeared to be a very superficial scrape. Sometimes, though, even very minor assaults to the skin introduce opportunistic bacteria which, under just the right circumstances, cause a major infection. If you have ever known a human who developed cellulitis as the result of a seemingly insignificant scratch, you'll understand what Jubal is dealing with now and how frighteningly quickly it can escalate. To combat the infection, Jubal was immediately started on antibiotics -- 2 days of injections, then 3-5 days of an oral type. He has been given anti-inflammatory medications for pain and to reduce both the fever and swelling. In addition to medication, cold hydrotherapy will be used to keep the swelling down and to keep Jubal's body temperature down, if needed. 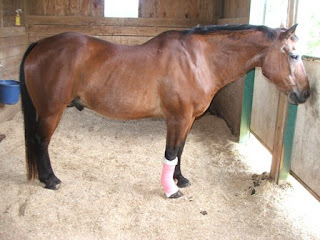 Another technique being used is a "standing wrap" which consists of elastic bandaging over cotton-like padding. While we don't want to downplay the potential seriousness of cellulitis, its a relief to see Jubal responding well to treatment so far. 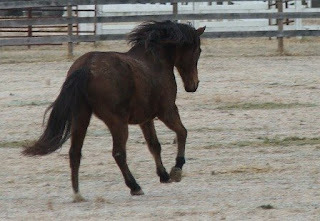 If everyone reading will cross your fingers, hold your tongues just right, and send positive vibes his way, perhaps our stoic old Foundation Quarter Horse will be back to normal in no time. And after that........well........maybe the universe could give the geezers a break for a while. Every now and then, we are reminded how fragile life is. Every now and again a horse, like a shooting star, comes into our lives and shines brilliantly; commanding our complete attention, then disappearing in only a moment. Such was Forrest. Even though his appearance was startling when he arrived, Forrest’s star shone so brightly that we could not help being optimistic about his chances. Then, in the blink of an eye, the star faded and vanished into the night sky. 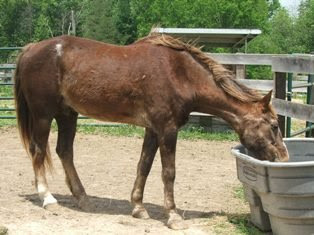 Horses like Forrest sometimes have a bigger impact on the Sanctuary than those that live with us for years. We remember most vividly the horses we could not offer even a few months of full stomachs, soft bedding and compatible herdmates. To that end, we hereby dedicate Traveller’s Rest Equine Elders Sanctuary to the memory of all horses, like Forrest, for whom help came too late. Rest In Grace, Old Gentleman. For the second time in six years, TREES is faced with the very real possibility of not being able to help a new resident. Forrest arrived Saturday suffering impaction colic. The situation probably existed for several days, at least, before he arrived. His emaciated condition, accompanied by severe dehydration, made the situation a tenuous one from the moment Forrest arrived. Despite the fact that he was perky and alert on arrival, and despite the hours the veterinarian spent with him over the past two two days, things do not look good for Forrest this morning. This is the heartbreak of "rescue." Knowing we cannot "save them all." The difficulty is knowing when to say when. Is today "when?" Should we try one more treatment? When does trying "one more thing" become unfair to the horse whose life you are trying to save? And..........Why do people wait so long before asking for help? Welcoming a new resident to Traveller’s Rest generates both excitement and apprehension. The prospect of getting to know a new family member is always exciting. There is, however, also a fear that we may not be able to find a timely resolution to whatever challenge the newcomer faces. Such is the mood today. Excitement mixed with apprehension. Tomorrow (Saturday, May 23, 2009) TREES will welcome an elderly gelding to be called “Forrest.” Forrest has been losing weight for some time and has been assigned a Body Condition Score of 1. (According to the Henneke Body condition Scoring System, 1 is emaciated, 4-5 is “normal”, while 9 is obese.) A recent veterinary exam revealed no obvious health problems other than anemia, which could be a result of the emaciation itself. So, how does TREES prepare for the arrival of a horse like Forrest? The first step was to visit the horse in his current home. We learned that Forrest has no functioning teeth to speak of, but was being fed a “sweet feed.” In general sweet feeds do not work well for dentally challenged horses because these horses cannot chew the whole grains that make up a large proportion of sweet feed formulas. Unchewed grains are passed out in the manure, obviously not being digested or providing any nutrition to the horse. The owner talked with an equine nutritionist and changed to a pelleted senior ration. The pellets were soaked to further reduce the need for chewing. 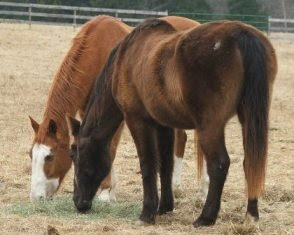 Forrest was separated at meal times so he would not be harassed by other horses while eating. Even with these changes, after two weeks showing little progress, arrangements were made to bring Forrest to the sanctuary. Preparing the stall involves first laying down 5-6 inches of pine sawdust for extra urine absorption, topped with 5-6 inches of fluffier pine shavings for cushioning. Often, thin horses do not lay down to rest. Having little or no flesh over their bones makes laying on even a moderately hard surface, like the ground, very uncomfortable. 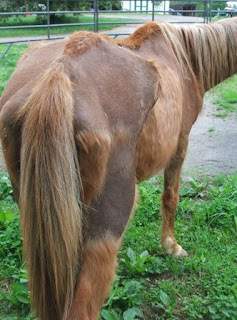 Some may even develop sores on pressure points such as hips, hocks, shoulders or fetlocks. Extra thick bedding invites a thin horse to rest in comfort. Very thin horses are also often dehydrated. Monitoring water consumption is important. 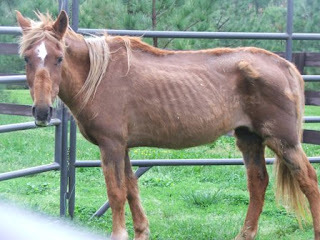 Some emaciated horses do not drink much for the first few days. It seems as if the body’s system that triggers “thirst” doesn’t function properly. To help increase water intake, meals are soaked even if the horse is not dentally challenged. Some horses, we’ve found, don’t like to drink from buckets hung in the stall, but will drink from buckets on the ground in the paddock. Both are provided so the horse may choose the water source most comfortable for him. Keeping the environment as stress-free as possible is also important. Each new arrival is first introduced to a private paddock. A routine is established and strictly adhered to for the first couple of weeks. Small frequent meals are served at the same times each day. 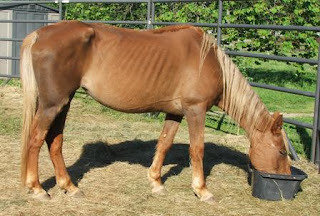 (Please note that suddenly feeding emaciated horses large amounts of food can cause a fatal condition called “Refeeding Syndrome.”) Hay is placed in the same location each day. The number of handlers and visitors is limited until the horse becomes comfortable with his new surroundings and the farm staff learns his habits and quirks. A veterinary exam will be scheduled as soon after arrival as possible. Naturally, any urgent needs will be addressed immediately. If not urgent situations, things like vaccinations, hoof trims and dental floats will be delayed until the horse gains weight and strength and is able to better tolerate whatever procedure awaits. Once our new resident is settled, our work is only beginning. 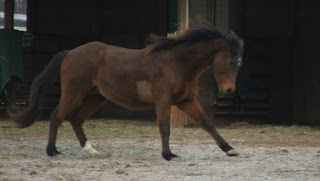 As the horse becomes comfortable and gains strength, his true personality will begin to emerge. As basic survival requirements become less of an issue, subtle symptoms of chronic ailments may become more obvious. What is this horse’s temperament? Which group of horses will work best as his permanent “band?” Are there any behavior issues to be addressed? What diet will best suit his needs? Was starvation masking chronic conditions like Cushings disease or insulin Resistance? How often will he need dental attention? Which volunteers are best suited to working around this horse? The questions are many, but each answer leads again to excitement. Each answer brings us one step closer to offering this horse happy Golden Years. Marye’s AeroMask. Wade’s mosquito mesh. Sonny’s fly boots. Val’s tooth fragment removal. Fitz’ heart infection diagnosis and treatment. Each mystery solved adds one more idea to the arsenal of options we can offer the next new arrival. Even though some horses do not stay with us long, we try to make sure each one spends his last weeks, months or years as happy and comfortable as we can make him. Beginning with Day One. Forrest’s arrival preparations began three days ago. We hope he enjoys many years in the company of TREES’ Elders. 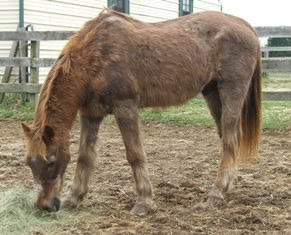 One of our resident Thoroughbreds has shown up in several recent photos, but we’ve never posted his story. 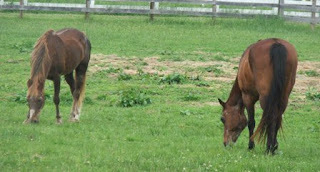 Fitzhugh Lee (left) is a big, hefty 26 year old Thoroughbred gelding. He arrived late last summer, but its only in the past few weeks that he’s really come into his glory. Fitz’ road to TREES began when his owners could no longer pay to board him at a stable in Maryland. Early in his story, the sanctuary had no space for another horse, but arranged to pay for a dentist visit to check his teeth. The big gelding was a little thin and had trouble gaining weight. The initial idea was to give him a good float, make sure he didn't have any cracked, loose, or infected teeth and hope that might help him gain weight, making finding a new home easier. The dentist called while she was with Fitz to ask just how much work we wanted to fund. His needs went way beyond a routine float. (In the end she donated most of her time...he made a big impression on her.) He had several infected teeth and she said his whole bottom jaw felt somehow unstable. The supervising veterinarian even theorized that Fitz’ jaw may have been recently fractured. At that visit, one tooth was removed and the dentist and vet returned several weeks later to extract a second. That helped and Fitz began to gain some weight. As several months passed, space became available at TREES, and arrangements were made to accept Fitz into the sanctuary. Soon after his arrival, based on the unstable jaw comments, we had Fitz’ jaw x-rayed. Some areas looked like they could have been healed cracks in the jawbone, but it wasn't clear what might have happened or when. More significant was that Fitz’ teeth, particularly his incisors, were not normal and he had serious periodontal disease. During the first several months he was here, Fitz just seemed "not right" in general. He sweat a lot when it wasn't very hot. He had a serious systemic reaction to vaccinations (sweating, colic, fever, etc,) he got very winded after trotting only a few yards, and his gums became bright crimson with a tiny bit of exercise. And he had a significant heart murmur. When we spoke with the vet about these symptoms, she immediately scheduled a cardiac ultrasound. Nothing appeared to be wrong with the heart valves, so the vets kept looking for the cause of the murmur. Finally, they got to the "bottom" of his heart and there was a large bacterial infection in one of his ventricles. Meanwhile, since he was sedated for the ultrasound, the vets took a closer look at Fitz’ teeth. His gums were receding so much that the roots of two teeth were almost entirely exposed. One had a huge tartar cap on it that was so hard it took a Dremel to drill through it and break it apart. (We've since heard this abnormal tartar buildup called a "cementoblast.") As the vet drilled into the cementoblast, the bit went right through what should have been tooth behind it and into dead bone. 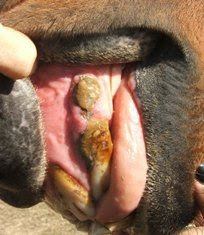 The infection in the tooth had moved into the bone and caused some decay. A second infected incisor was also removed, but there was no bone involvement in relation to that one. That left one more incisor with most of the root exposed, but it still seemed to be firmly in place and not infected, so it was left alone for the time being. We treated Fitz’ heart infection for the first time the last half of December and all seemed well. Last month, however, during a routine exam at vaccination time, the vet was not happy with Fitz’ heart sounds, so we treated again, this time for four weeks. Somewhere during the third week, Fitz suddenly started to pack on weight. So much so that we've cut his food back by half and may need to cut back more. He’s confident, full of energy and showing a playful side we hadn’t seen before. All of Fitz's problems ultimately related to his teeth. As happens in dogs, cats and humans, it appears that the infected teeth, gums, and bone led to a systemic infection that led to the bacterial colony in his heart. All the information the dentist was able to find on similar cases points to this periodontal issue being chronic. Fitz will need to be monitored for that frequently, and may eventually lose more incisors. Theories say it’s likely related to an underlying endocrine abnormality, (Cushings would be one possibility, though we haven't seen any other symptoms of that) leading to a suppressed immune system in general. For now, though, our big Thoroughbred is feeling better than he has in some time. Once again, thank you to our incredible vets who don’t view age as the primary reason behind things like lethargy or weight loss. 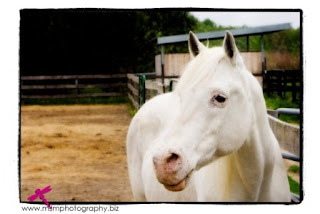 Older horses may be more prone to certain illnesses than younger horses, but old age itself is not a disease. If your elder horse seems “off” and someone tells you “he’s just old,” but you feel there is more to it than that, please don’t hesitate to get a second opinion. After all, nobody knows your horse as well as you know him. When Marye came to TREES last summer, emaciated and with severe COPD, we didn't know if we could offer her many more days on this earth. Initially we were able to manage her symptoms well enough to allow her to eat normally, but her breathing was never "normal" until well into November. 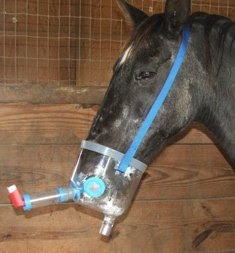 As a last resort, this spring we appealed to TREES' visitors and supporters for an Aeromask Equine System. We'd never heard of this system before, and knew no one using it, but thought it looked promising. In April, two of our most dedicated volunteers, Gene and Carol, donated funds for the mask. It arrived within a week. 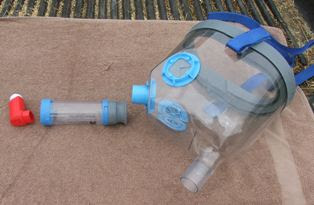 The main parts of the inhaler system include a plastic cup that fits over Marye's muzzle, a tube to direct the medication into the cup through a rubber port, and a "human inhaler" that expels the medication into the tube. Marye was prescribed two different medications, one to be given in four "puffs" once a day, the other in eight "puffs," twice a day. Easy, right? Well.......sort of. Its easy once you get the hang of it, but there is a little bit of a learning curve. In order for the treatment to be effective, the timing must be just right. If the inhaler is "puffed" as Marye is exhaling, the medication will go right out the exhalation valves. So, the person doing the "puffing" must watch the valves closely to determine when to express the meds. It may vary a little depending on the person's reflexes and reaction time, but it seemed the optimum time to puff is just before the exhalation valve closes completely. It probably also depends, to some extent on the horse's breathing rate and how much time you have between the exhale and the next inhale. Now, add to that waiting 30 seconds between puffs. So you're watching the valves, watching the clock, and remembering to "puff." All while keeping an eye on the horse's "eye" and attitude about the whole idea. Marye, though, is a real trooper. She seemed to understand the process and stood as still as she could as we asked her to breathe through a plastic cup filled with some odd smelling vapor. In the days before first treatment, Marye's breathing ranged from 36 breaths per minute to just over 40. (At her worst last year, her rate weas close to 60 breaths per minute.) At the end of the fourth day, on May 3, her respiratory rate was down to 18 breaths per minute. On May 2, a rainy spell began that lasted for 11 days. As the pollens were washed from the air, we discontinued treatment on May 4, and Marye's breathing has remained normal. As we go into summer, we may need to resume treatment, but for now Marye and all her humans are thrilled with the results. Thank you, again, to everyone who supported this treatment trial and to those who offered other ideas to manage Marye's COPD. Her Ladyship is feeling very pampered and extremely grateful that no one gave up on her. Lizzie stole the spotlight for the last week and a half, but we didn't want to neglect updates on our other recent arrival, Josh. Here is Josh on April 11, still wearing very impressive winter woolies. And here is Josh now! Look HERE to see if you have "Things We Can Use." Send TREES the Proof of Purchase seals from Triple Crown, Reliance and Legends feed bags. Depending on formula, we can redeem them for 10 -25 cents each. Offer a caring home to a horse who has served his owners long and well, but is no longer considered "valuable" enough to warrant further investment by those owners. 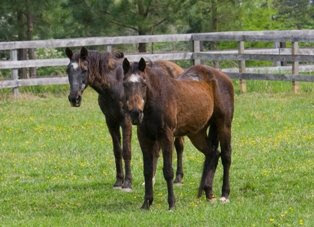 Help to educate owners struggling with their Equine Elders' changing needs. Participate, with your Elders, in local shows, parades, and other events to demonstrate that a horse's abilities cannot be judged based solely on chronological age. Donate gently used tack which we can sell through local consignment shops to raise funds. Donate gently used household items for Yard Sales. 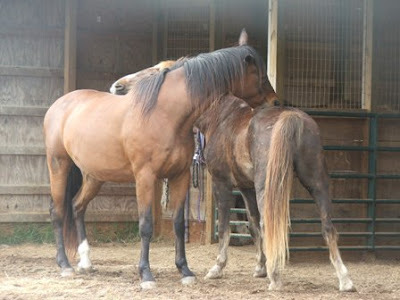 Make a tax-deductible contribution to Traveller's Rest Equine Elders Sanctuary. Amazon.com: By entering the Amazon store through this link, and shopping as usual, you can earn Traveller's Rest a few pennies with every purchase! $17.50 - senior feed for one Toothless Wonder like Sonny for one week. $37.50 - joint supplement for one week for one arthritic horse such as Jubal. $910 - senior feed for one Toothless Wonder for one year. A little update on lizzie, who arrived a week ago yesterday. TREES' philosophy on feeding undernourished horses is the KISS philosophy......."Keep It Simple, Sweetheart." 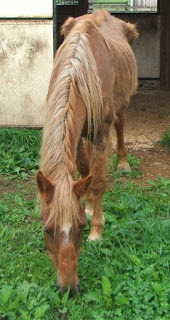 We don't like to introduce too many new things to a gut that has been inactive for some time so, unless something special is recommended by our veterinarian, thin horses are offered only soaked senior feed and hay. Lizzie is currently eating four meals a day, each 1-1/2 pounds of Triple Crown Senior, soaked to make a "mash." As she continues her recovery, amounts may be increased, based on rate of weight gain. Remember, last Valentine's Day, how excited we were that Wade had finally made friends with another horse? 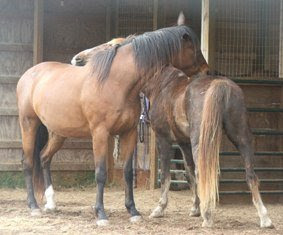 Wade had become the object of Marye's affection, and the two spent a lot of time grazing together. Well. our fickle female has changed her mind. Apparently, Val (front) is now the most desirable companion in the field. Maybe its "birds of a feather" syndrome? New Arrival - Meet Lizzie! Lizzie arrived the evening of May 6, 2009. We don't know much about her yet, but we can say there is not a thing wrong with her appetite! 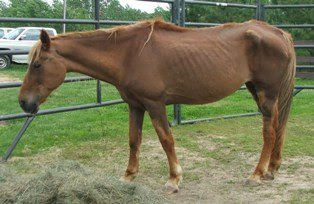 We'll start out feeding Lizzie small, frequent meals and limiting her turnout to avoid "refeeding syndrome"
No kidding! This is Freddie, as is, no special grooming, bathing, or "photoshopping," after several days of rain and mud. What a good guy. We also have to take the opportunity to point out that Freddie is one of TREES' Cushings patients. Freddie's symptoms have been controlled for three years now, using dietary management and Pergolide. Again....Thank Goodness! Can you imagine dealing with an almost white "Cushings coat" during mud season? We don't even want to think about that prospect.